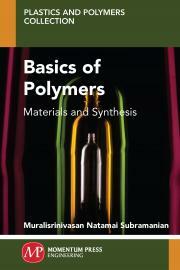 This book is designed to be used as study materials for students, professionals, and professors that support their wide use on material and synthesis. It emphasizes the value of each relevant synthesis method and polymerization type, rather than complex mechanisms or the history of its development. An area of considerable interest in this book is polymer synthesis in terms of the relationship between the structure and function of monomer(s). This book is also directed toward postgraduate students and practicing engineers who wish to develop polymer synthesis. Muralisrinivasan Subramanian is a plastics technology consultant specializing in materials, additives, and processing equipment, including troubleshooting. The author obtained his B.Sc in Chemistry from the Madurai Kamaraj University and his M.Sc (1988) in Polymer Technology from Bharathiar University. He received his Post Graduate Diploma in Plastics Processing Technology from CIPET, Chennai. He has also completed his Doctor of Philosophy in Polymer Science from Madurai Kamaraj University.